This weekend marks the start of our busy holiday season of house guests…we move quite frequently with the Army and how many guests we get each year depends a lot on where we are living that year. This is our second year in our home here in NC and we have lots of family along the mid-Atlantic so we’re expecting to entertain quite a bit over the next two months. 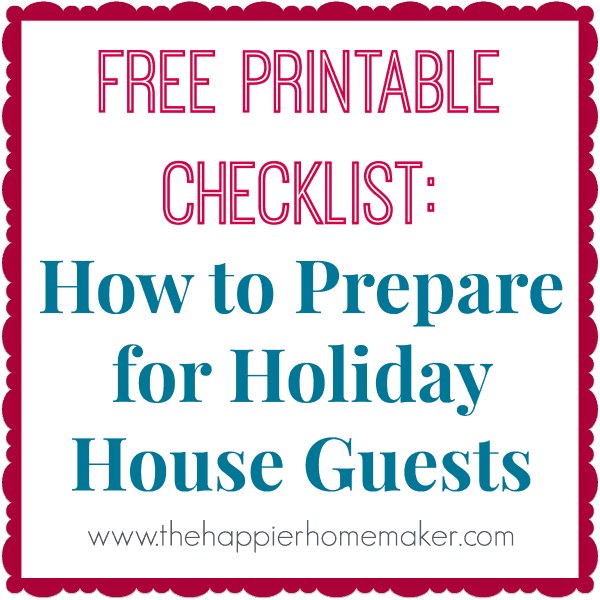 When preparing for house guests the most important thing to remember is not to stress!! I can almost guarantee that none of your visitors are expecting Martha Stewart style perfection! By taking a little bit of time to prepare your home and adding a few special (but easy) touches you can make your home a warm, inviting destination for house guests! One of the main things I do before guests arrive outside of regular cleaning is to declutter! With three little boys we are under constant siege by Lego creations and they end up everywhere. Before guests arrive I corral all toys to the boys rooms and talk with them about keeping them there while our visitors are here. I also put away clutter that tends to accumulate on countertops and desks-especially personal things like bills. Will your guests have their own room or will they be staying in a common area? We haven’t had a dedicated guest room in our home in years and at various times I have set guests up on an air mattress in our bonus room, one of our boys rooms, even on an air mattress in a formal living room area. For small spaces, a hideaway bed disguised as an ottoman is a great option. No matter where your guests are try to ensure they can have privacy, especially in the mornings and evenings. If you can’t put them in a private area of the house consider a small screen to separate their sleeping area from the rest of the house. Try to provide your guests with adequate room to unpack and store clothing. If possible, keep a lamp next to the bed so they can turn it off from the bed and not have to stumble to bed in the dark. Adding nightlights to hallways is also helpful in helping guests get around in the night. Assess your home-do you have enough seating? Are there adequate areas for guests to eat, relax? If budget allows consider adding a few new decor items to address any areas your home may be lacking. Plan your menu (at least roughly) for the duration of your guests’ stay. You don’t want to have hungry visitors and nothing to make for dinner! Also be sure to inquire if your visitors have any special dietary needs so you can prepare. If you won’t be cooking formally for breakfast or lunch keep easy to make items handy like sandwich supplies, cereal, toast, etc. I also like to set up a little drink/snack station on the kitchen counter so guests can easily find cups, make coffee, or grab a snack without feeling like they are imposing. Be extra aware of the bathroom your guests will be using. Put away personal items and be sure that extra toilet paper and a plunger can be easily found…there’s nothing more uncomfortable than needing those items in another’s home and not being able to find them! Keep extra pillows and blankets near your guest’s sleeping area so they can easily help themselves and stay comfortable. If possible consider adding a fan as well in case they would like to sleep cooler than your home’s temperature. Have plenty of towels and washcloths in an easy to find area of the bathroom. Keep books and magazines on display for times when guests are amusing themselves. Set up a guest password for your WiFi and provide it (written down) to guests when they arrive so they can access the internet during their stay. 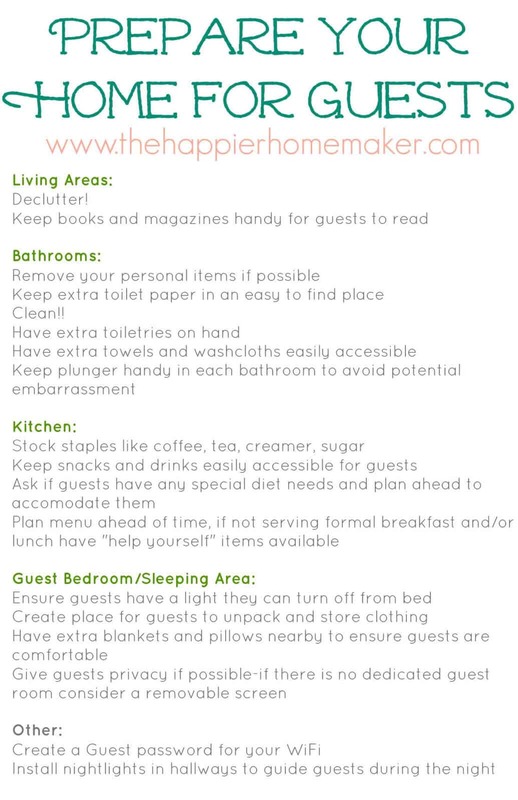 All of these tips can be found below on this free printable, just click on the image to download!